The words Detroit Commerce Bldg. 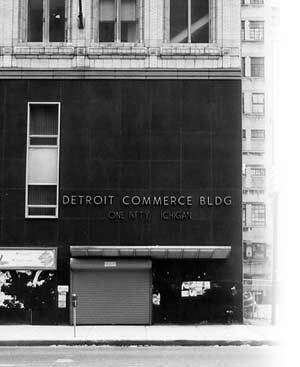 hovering above sealed entrances marks the location of one of Detroit's vanished department stores, People's Outfitting Company. Situated between the Woodward and Washington Blvd. retail districts, People's would do booming business here for many years. While its rivals are gone and their buildings demolished People's 12 story tower suffered a happier fate. A mid-1960's conversion brought it back to life as an office building. Sadly it would be a temporary reprieve as by the mid-1990's the lights went out. Now it sits hoping third times a charm.